Yet another American on here. Have followed football for a few years (07/08) now. No club really stuck out, I wanted a club to call mine own but wasnt going to pick a club just to pick a club, but over the last few years I have started to feel a pull to Wolves, I guess it started following thier promotion chase which as an American i love the concept of Relegation/Promotion. Im of Irish decent (Cork) so that was another pull with current squad. Last year was a roller coaster. Then I just knew that after nearly 4 seasons it finally hit me, for better or worse I was a Wolves supporter. I now wake up at 7:30 so I can get pissed when Swansea go up 2 then the relief of getting the draw and needing bourbon all before breakfast. My girlfriend and I are planning a trip to London next spring , Im making sure we go when Wolves are at home so I can catch a train ride up. Its looking like the Bolton match March 31st. P.S. 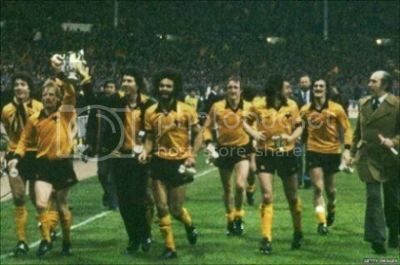 I got The Boys from the Black Country on my kindle and Im loving that book and recommend it, its a great and funny insight into the club's past, great for any American to understand the history of Wolves. Depends if he wears a pair of gold tinted spectacles? If you wanna be part of the "Glow" you'll need a tin hat to enter Wolves chat. Conversely if you want to moan about something you'd better wear a tin hat too, in fact just wear a tin hat, and a flak jacket would come in handy too. Welcome aboard and enjoy the roller coaster ride. Once a Wolf, always a Wolf. Where's the fun in supporting a top club? That's just for socially and morally inadequate glory seekers. Brilliant to see fans abroad, all due to Mick. Thanks to all the greetings. It now looks like we will be coming over the weekend of April 21st the Man City match. Tickets im sure will be very hard to get so I take it a membership will be needed to get tickets. Can I get 2 tickets with one membership or is it one membership one ticket? Also I have looked at the London Wolves site and seen they travel up for every match and I think that is something I would like to do if anyone on here is with the group can the give me any info, a pm maybe? You pay your membership to London Wolves for one (£22 I think) and then can pay a supplement of a couple of pounds to bring a guest along with you. You need to order your train tickets a few weeks in advance of the game, and I guess in your case, because you live abroad you'll need to have sent money in advance. Peter Woodifield can also get you match tickets because you're a London Wolves member (just let him know which part of the ground you want to sit in), but again you'd need to pay him in advace. This way you won't need to take out Wolves membership. We meet at Euston Station inside on the concourse down by the left hand corner as you look at the platforms at either 8.00am (to leave at 8.25 am) or 9.00am (to leave at 9.25 am) depending on circumstances. There are about 40 of us who go at any one time and are quite easy to spot on the concourse. We usually get the 5.45pm train back to Euston (but sometimes it has to be an hour later) and it takes a couple of hours each way. To join the club just follow the links and when you've got your membership contact Peter to book your tickets by following the links on the site and he'll email you back within a couple of days. If you want any more info then PM me.